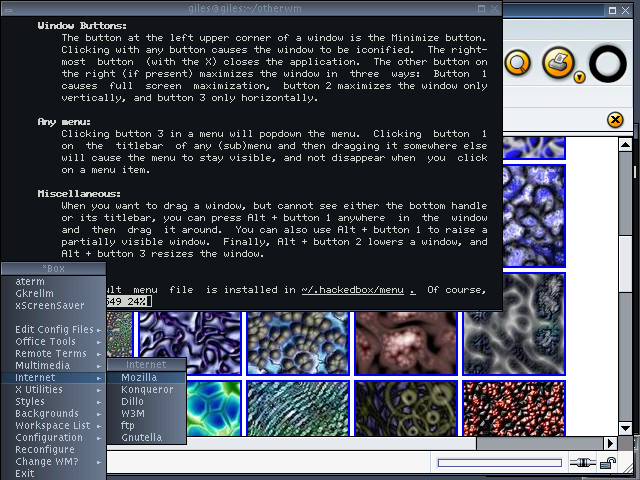 A screenshot of HackedBox, showing Mozilla in the background, a term in the foreground, and the main menu at lower left. I used 0.8.2, the latest version in October 2003. Not very good. Documentation claims that HackedBox uses a program called "epist" to do the key mapping, as Blackbox (which HackedBox is based on) uses "bbkeys." There was no epist binary, but it did ship with bbkeys, which works. No bbkeys documentation, since HackedBox doesn't use it. What was accurate in the documentation could probably be attributed to the work of the Blackbox crowd. As themeable as Blackbox and Fluxbox, uses the same themes. No shaped windows, changes are appearance rather than behaviour. HackedBox is a reduced version of Blackbox, removing the toolbar and the slit to reduce its size. Its look and behaviour are nearly identical, except for the lack of toolbar and slit ... The default appearance frames all windows in red and provides a background of stylized flames - annoying, but easily changed. See the Blackbox entry for a general idea of the behaviour of the Blackbox family. Like Blackbox, the ability to bind keys has been put on an external program. Evidently the HackedBox programmer is working on something simpler than Blackbox's bbkeys, because it's documented - but not supplied. bbkeys is supplied, but not documented. As noted with Blackbox, making this an external app rather than bringing it into the window manager really appears to consume a lot more memory: Fluxbox incorporates the ability to bind keys, and is smaller than the combined size of HackedBox and bbkeys. Requires an accessory program to bind keys. Poor documentation.